Bermuda faces unique problems in waste management. It is the third most densely populated place on earth, with an estimated resident population of 68,500, in its 20.75 square miles or 3,301 permanent residents per square mile. In terms of population per square miles, this is exceeded only by Monaco with 15,921 and Singapore with 6,891 persons. To aggravate the problem of population density, Bermuda generates more rubbish per capita than most industrialized nations, including the U.S. In the twice weekly curbside collection householders are urged to pre-sort items destined for incineration at Tynes Bay into burnable household waste, and cans and bottles earmarked for recycling. The recyclables are to be put in separate, clear plastic bags. 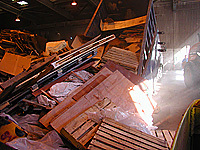 A new recycling plant was opened in April, 2007. It will deal with glass, aluminum, and tin and has the capacity to recycle other materials. TAG is the message for Bermudians and stands for Tin, Aluminum and Glass. Residents are urged to TAG their waste following the official opening of the Island’s Recycling Center which will have a key role in helping Government to attain its goal of doubling recyclable processing from 25 to 50 tons a week by 2008. 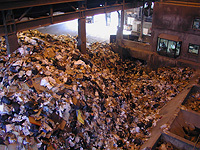 The facility is capable of processing 25 tons of tin, aluminum and glass in just one day. At left are images of a full bunker (top), the result of having one of the two streams down for maintenance for only a few weeks. Also pictured is the location of the Hazardous Waste Disposal site at Tynes Bay which is offered to the public every 4 months. The Public Drop-off is another location where the private individual can deposit their refuse and recyclables. The Public Drop-off is open every day of the year from 7 AM to 7 PM. 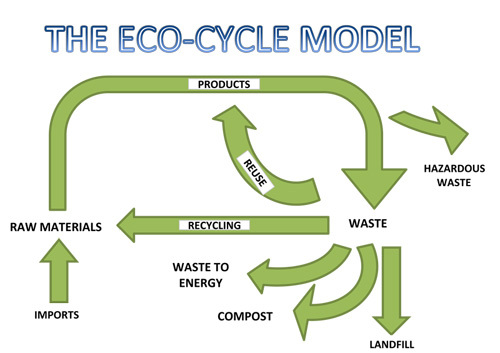 Below is a drawing of an Eco-Cycle showing the path of goods coming into the country becoming waste. With RE-USE (re-use it centers, residential re-use of items, recycling of clothing, etc), RECYCLING, and COMPOSTING, Bermuda`s waste can be greatly reduced.